You know that Taito would never pass on an opportunity to port the 30-year-old arcade hit Space Invaders to a platform. Seems it's doing the same for Cooking Mama, shipping iPhone versions this week. Fortunately, both ports look like fully-fledged, non-half-assed versions of each, with Cooking Mama taking advantage of the iPhone (and the iPod touch, naturally) hardware with touch and accelerometer gameplay. We personally can't wait to knead raw hamburger by shaking our iPhone silly. The Space Invaders iPhone app looks like... Space Invaders. Control on the 1978 arcade classic make us a bit more wary — it features tilt, drag and on-screen touch styles. But the inclusion of character art and bonus material makes the price a little easier to swallow. Oh yeah. Price. 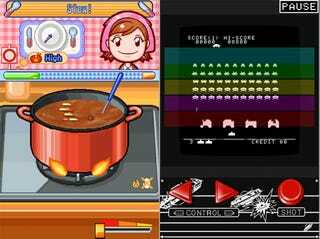 Cooking Mama will set you back $6.99 USD, with Space Invaders more appropriately cheaper at $4.99.